Today is Ascension Day, a moveable feast observed by Amish in some settlements but not in others (and of course, by other Christian denominations as well). Last year’s piece on the Amish & Ascension Day looked at how Amish in some places mark the day. Businesses are often closed and the day is spent as a family day or opportunity to visit. I have no hard data, but it seems to me that more Amish observe the day than do not. Besides those in Lancaster County, northern Indiana, and Holmes County, you shared a number of other communities where Ascension Day is observed, including Ethridge, Tennessee, Cadiz, Kentucky, and Appanoose County, Iowa. 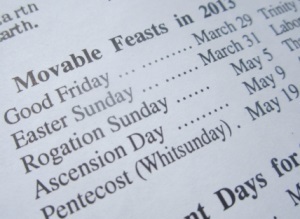 Ascension Day is definitely observed in the Paoli and Orleans, Ind., communities I often visit. I think it is the least well-known religious holiday amongst non-Amish who visit Amish communities. I’m sure that many non-Amish have gone to Amish stores/farms to purchase things on Ascension Day and have found on that day it is “no sale”. It is hard to remember because it changes every year and often falls on a weekday. I’ll never forget on Ascension Day in 2011, I went to an Amish farm at Paoli to place a large order for produce and found at the driveway into the farm two large sawhorses, with ropes hung in-between stating, “No sales today – religious holiday”. This was interesting, because on Sundays they just have a simple sign by the driveway “No sales today”. So if you’re looking to visit an Amish store today, chances are you may run into something like Al did. If you’re not sure, you might want to wait until tomorrow. Swiss do not observe Ascension Day? As for those who do not observe the day, Kevin Williams shared in The Amish Cook at Home that the Swiss Amish of Adams County, Indiana do not do anything special for the Ascension. Contributor Tom Geist also discovered that those in Seymour, Missouri do not mark the feast. Based on this, it’s possible that Ascension Day is generally not observed in the Swiss Amish tradition. 9 responses to Are Amish Shops Open on Ascension Day? I do find it interesting which religous holidays the amish do observe. We ran into that once when we found the Amish stores closed on St. Michael’s day. Of course the observance of ascension is different among Catholics as well. Some diocese observe it today while others (mine included) transfer the observance to Sunday. Yesterday I was going about my business and walking toward the bus stop nearest my home, when I spotted two clearly Old Order people walking down other side of the street. They very clearly stood out from everyone else in the area, the man was wearing a straw hat and suspenders and the woman was even more conservatively dressed in very long dress, the V-shaped shall thing, and black pleated prayer cap, her blouse; the arms of which you could see where a striking purple to the rest of her black clothing. I noticed that they walked over to the local donut shop opposite the bus stop I was waiting at. Taking a bus that takes longer to arrive, I saw them leave the store, happily munching on sugary doughy treats as they walked in the direction they came and then climbed into a friend or relative’s mini-van. Sorry for going off topic. Otherwise I’d like to wish those Amish and other folks who mark the day a spiritually uplifting Ascension Day. It is very interesting that many Amish observe Ascension day as a holy day. Since it is celebrated 40 days after Easter, it will always fall on a Thursday. In the Catholic church it is refered to as Ascension Thursday. Amish shops are closed on Ascension day in the communities of Arthur, Illinois and both Elkhart Lagrange and Nappanee in Indiana. I cannot speak about other communities. Even the local english owned RV factories are closed — a reflection of their Amish workforce. In Synder county, Pa., today all of the businesses were closed as well as most of the Mennonite businesses. Actually most businesses are Mennonite owned but employe Amish associates in order to present an Amish owned image. Very clever marketing. On a side note, at the Green Dragon in Epharta, Pa a friend, of Asia descent owns a seafood stall that employes only Amish workers in order to present an Amish owned image. May 29 it states, “Ascension Day — All Amish Businesses Closed”. Thanks, Susan, for sharing that Ascension Day is always on a Thursday. I hadn’t realized that before. The Troyer Amish of Conewango, NY and the upstart communities of Angelica, Dansville and Wellsville are closed on Ascension day. Thanks for the contributions on other communities. More support for the idea that most Amish observe this day. Leave a reply to Are Amish Shops Open on Ascension Day? How do Amish observe Ascension Day?